Colorful Secure Luggage Tags were the gifts of the 2014 Christmas Season. However, even the added level of security they provide could not convince my husband to attach something that colorful to his dark masculine (AKA: boring) luggage. So he received a manly version. Sewn from black marine vinyl – any small scrap of vinyl will do. 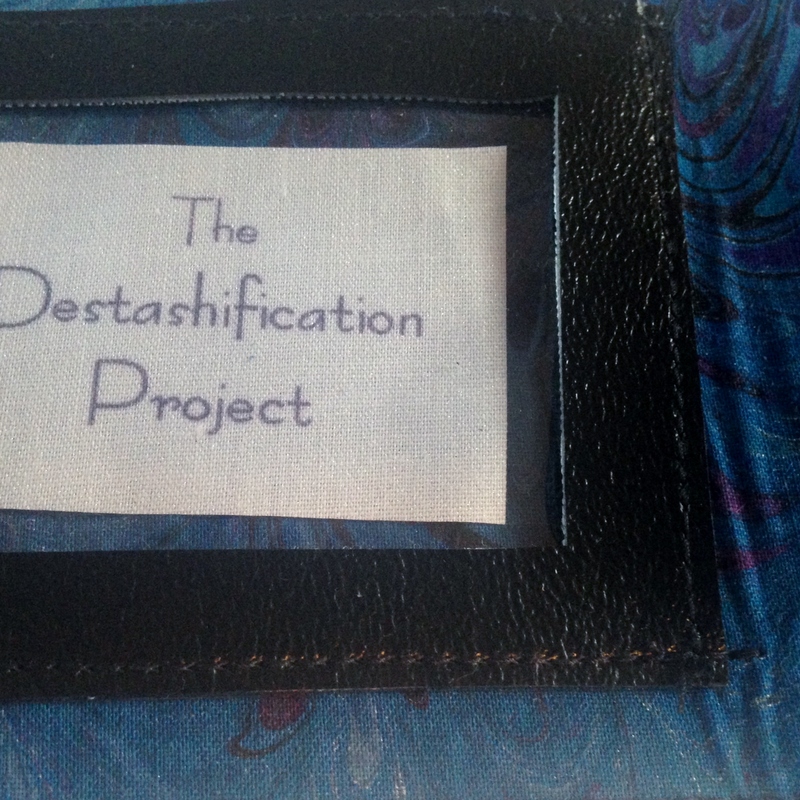 This one is lined with a beautiful hand marbled dark blue fabric scrap. 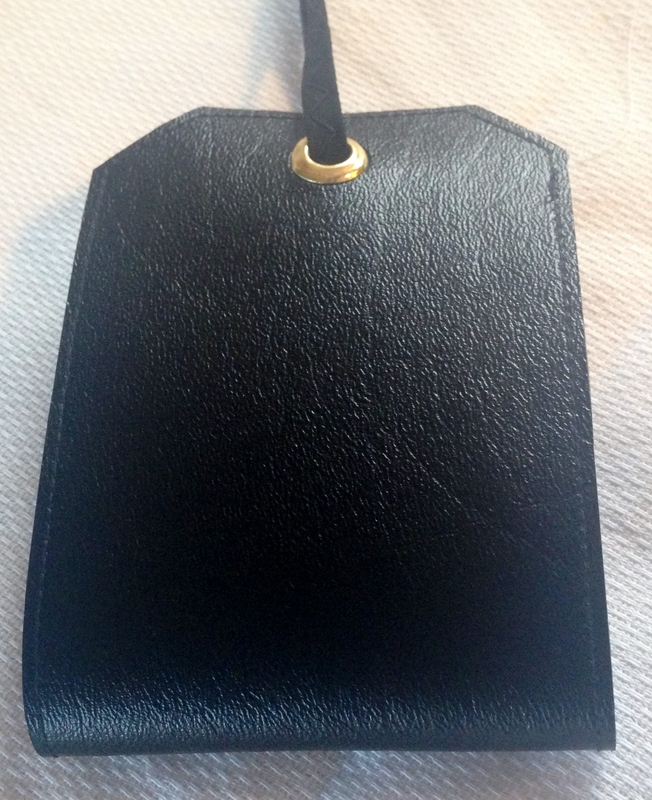 It turns out making the tags from vinyl is simpler than sewing them from fabric! The tutorial for the fabric versions is located here. The vinyl version requires only 3 pieces – and no interfacing. Cut a piece of the vinyl and the lining into rectangles just larger than 3″ * 9″. Glue them, wrong sides together, using spray adhesive (applied outdoors). Allow the spray adhesive to dry. Righthand shape and lower lefthand shape are used to make vinyl version. Using a (sharp) rotary cutter, cut the rectangle into the shape shown in Photo. Cut 20″ or so of selected ribbon. Topstitch very close to edge all the way around, catching ribbon on short, straight end of tag. 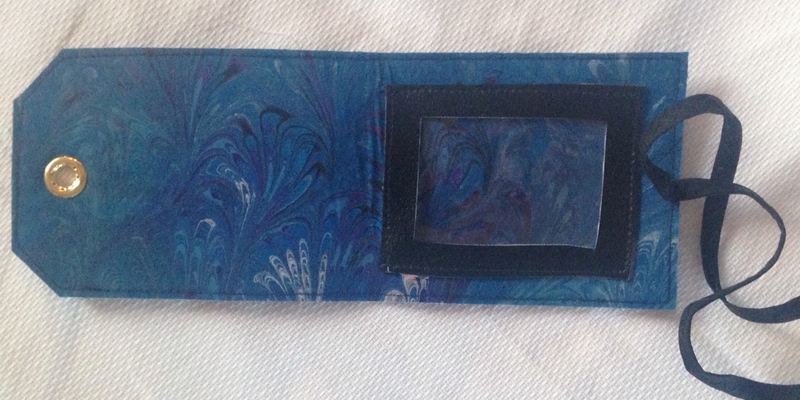 Cut a piece of vinyl into the 3.5″ * 2.5″ frame shown in the lower left hand corner. Frame sewn to fabric side. Ribbon caught by topstitching. Grommet in angled end. Cut a piece of clear vinyl (I use blanket/quilt carrier vinyl as it is quite pliable) just smaller than 3.5″ * 2.5″. 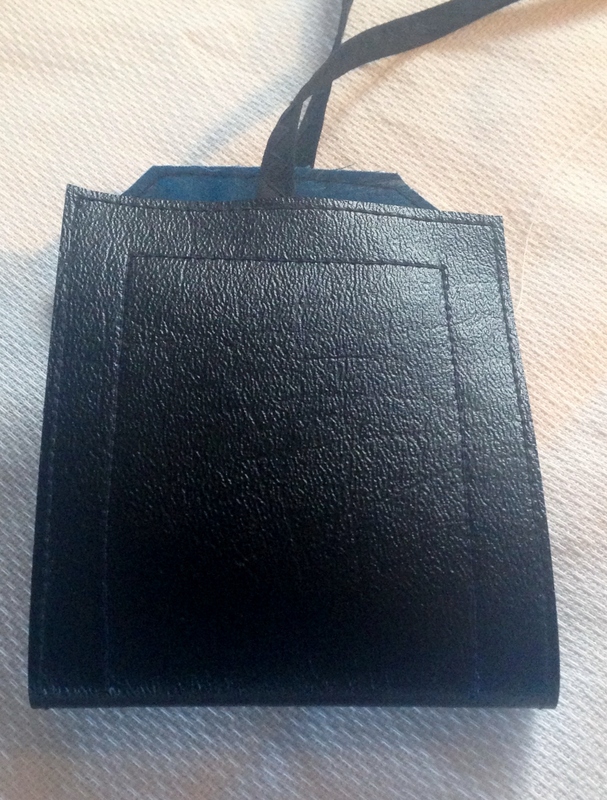 Place the clear vinyl under the frame on the fabric side of the luggage tag. Sew through all layers on 3 sides of frame (one side has to be left open to put contact information under clear vinyl). Add a grommet to the short angled end (a paper hole punch actually works well to cut the opening). This entry was posted in Accessories, Luggage tags, Repurpose, Scrap Couture, Sewing, Stash Couture, Tutorial. Bookmark the permalink.